One of the most famous “sea monsters” of all time – so famous that her outline graces the Ocean of Pseudoscience Week logo – actually lives in a lake. I’m talking, of course, about “Nessie”, the Loch Ness monster. Local reports of a bizarre creature inhabiting the Scottish lake go back over a thousand years, but the story became popularized in the 1930’s when Dr. Robert Kenneth Wilson took a now-famous photograph. Nessie is believed by many to be a plesiosaur that somehow survived the extinction of the rest of her species. Propelled by public interest, numerous scientific expeditions have been launched over the decades to find her. 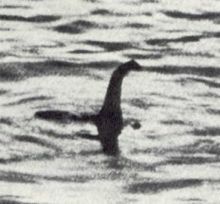 Using SONAR, submersibles, and hydrophones, teams of experts from around the globe have consistently failed to find any sort of actual proof that Nessie is there. Several explanations have been proposed for the sightings and Dr. Wilson’s photograph. Some experts have proposed that tourists eager to see Nessie have, in their excitement, misidentified common animals (eels, seals, large fish) or common objects (logs). Others have a simpler explanation – people who want to become part of the legend are making up stories. The most interesting explanation for Dr. Wilson’s photo I’ve heard is that it’s of an elephant’s trunk (check out this National Geographic article on the subject). Yes, I know that elephants don’t live in Scotland, but I challenge you to show me something in that photograph that proves it was taken in Loch Ness. Again, a simpler explanation exists – the photo was faked. According to the Museum of Hoaxes, Christian Spurling confessed on his deathbed in 1994 to helping fake the picture using a toy submarine and a plastic model of a plesiosaur head. He allegedly gave the photo to Dr. Wilson who would be more likely to be believed. While Nessie is the most famous Lake Monster, there are many others. My family regularly vacations in upstate New York, and I grew up hearing tales of Champ (the Lake Champlain monster). The story is similar in most cases – some locals swear that something lives in the lake, lots of witnesses claim to have seen something, and not a shred of evidence exists to prove any of it. Nessie easily earns a place in our list of favorite sea monsters. Campania. This work is of extraordinary importance. dedicated to the myth of the Monster of Loch Ness known as Nessie. himself as confirmed by a scientific study of his calligraphy. piece of art was found, as said above, by chance by policeman Raffaele De Feo. vast public, but my wish is for it to obtain even larger and wider popularity.